I think every blogger in blogland went out and purchased Glamour magazine for the free Balance Me samples. Yes, you guessed it I did as well and opted for the Wonder eye cream Balance Me products are made in the UK and promise to be free from parabens, sulphates, mineral oils, silicones, DEA, PEGs, propylene glycol, artificial fragrance and colours. The Wonder Eye Cream is claiming to brighten and smooth the delicate eye area, nothing usual there. It is full of wonderful ingredients like coconut, rosehip, jojoba and carrot oils. The cream is light in texture, pleasant to use and absorbs quickly. I have not suffered any irritations whilst using this product and as you know that is a common problem for me. My eye area is extremely sensitive. Here comes the BUT......there is no wow factor for me with this cream. I neither love it nor hate it. 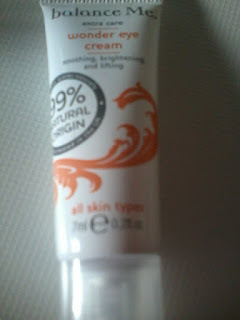 I already own Green People eye cream and it is very similar to Balance Me. As far as I am concerned they perform identically on my skin. The one difference I can spot which is important to me is Balance Me eye cream costs £20 for 15ml and Green People around £8 for 10ml. Hand on my heart and I am no expert but can I really justify buying the full size. This is not the first time I have felt this way about Balance Me products. Last year I reviewed another Balance Me freebie, the Rose Otto Body Wash. Once again a nice product to use but I honestly feel you can get the same for cheaper. I certainly recommend the brand for their free from ingredient policy. I would not grumble if these appeared in my Christmas Stocking, however, for those on a budget you can find equivalent products with matching ingredients promises for cheaper. Thank you, I did see the REN freebies but decided not to get them. I tried a cleanser and it was ok. Pretty similar story as Balance Me, I think it's a bit over priced but would happily buy if discounted. I've wanted to try them ever since I saw them in QVC last year. I am such a QVC sucker haha. That's so funny, I am always being laughed at for my over sensitive sense of smell. I can hunt out a bacon sarnie from a mile off! I found it to have a really light herbal scent, but very pleasing. The Bioderma cream was such a barg, I thought they had priced it wrong but it was around the same price in every pharmacy I went in to (loads haha), definitely an underrated product from their extensive range.